Mix of annuals and perennials. 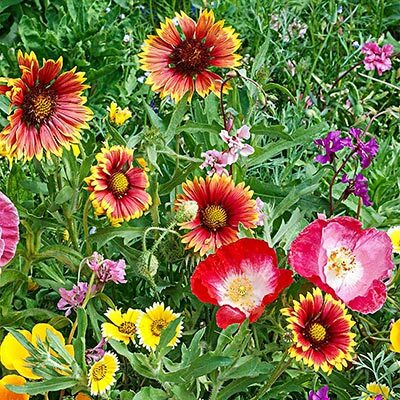 Includes Annual Baby's Breath, Black-Eyed Susan, Clasping Coneflower, Corn Poppy, Gaura, Gilia, Indian Blanket, Lance-Leaved Coeropsis, Four O'Clocks, Gayfeather, Leavenworth's Tickseed, Lemon Mint, Moss Verbena, New England Aster, Plains Coreopsis, Perennial Lupine, Purple Coneflower, Red Phlox, Scarlet Flax, Scarlet Sage, Sulphur Cosmos and Tree Mallow. For each offer ordered, get approx. 300 seeds per pkt..
Spacing: 1 inch apart in rows 12-24 inches apart, or mix seed with 1 quart of sand and broadcast evenly.